Subway is in the midst of a wide expansion drive across the UK and Ireland. With its 41,000 stores having already ousted McDonald’s to become the biggest restaurant chain in the world, the franchise plans to almost double its number of stores in the UK by 2020. Whilst this plan is Subway’s response to growing demand for affordable and healthier food on-the-go, over the last few years the brand has struggled increasingly with perceptions of its brand. This can be attributed to increased media scrutiny over its ingredients, such as the Daily Mail uncovering higher calories and salt in your average ‘Sub’ than a Big Mac, or its following of controversial halal slaughtering guidelines. So how does getting a celebrity on board help change peoples’ opinions about a brand, in this case Subway? Fritz Heider’s ‘Balance Theory’ suggests that, as individuals, we constantly seek for consistency in our beliefs to maintain a psychological ‘balance’. Brands like Subway use this to their advantage, knowing that positive associations with popular celebrities can therefore ‘rub off’ on their brand. To put simply, if we like Daniel Sturridge, we are more likely to like Subway, simply to maintain this balance in our minds. One positive relationship alongside two negative relationships. In selecting Daniel Sturridge as an endorser in the UK, Subway possess a national hero and uncontroversial figure who likely has a largely positive reputation amongst target consumers, therefore maximising potential for favourable perceptions transferring onto Subway. In line with this, Subway’s celebrity endorsers are localised by country, such as using Washington Redkins NFL quarterback, Robert Griffin III, in the US. 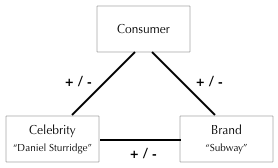 This entry was posted in Communications and tagged Balance Theory, Brand Image, Brand Perceptions, Celebrity Endorsement, Daniel Sturridge, Fritz Heider, Gillette, Subway, Tiger Woods. Bookmark the permalink.